One player in the Ross County squad to feature against Queens yesterday was Colin McMenamin. McMenamin of course spent six months playing for Queens last season in what turned out to be a successful move for both parties. Colin McMenamin was born in Glasgow but raised in Dumfries. At age fifteen he was on schoolboy terms with Queens. There was though a parting of company and it was many years before Queens and McMenamin were reunited, on the same side at least. McMenamin spent time at Annan Athletic as did Ryan McGuffie. Both were next signed by English Premier League big guns, Newcastle United. Managed by Bobby Robson, Mick Wadsworth was Assistant Manager, someone later destined to influence McMenamin’s career beyond Newcastle. In the young McMenamin’s first season Newcastle finished 11th. This was bettered the season after when the club finished fourth achieving a Champions League place. McMenamin was given a squad number that second season, 37 (38 was awarded to McGuffie). Neither player made a first team appearance in a massively financed squad of mega earning star name players. The striker’s berths were dominated by Alan Shearer and Craig Bellamy, with additional competition for the 2 front spots coming from Shola Ameobi, Lomana LuaLua and Carl Cort. McMenamin moved on at his second Geordie season’s end (as did McGuffie). McMenamin arrived at SPL club, Livingston, for whom he league debuted on 22 September 2002 as an 86th minute sub for Spanish import, Quino. The opposition were the Aberdeen side of Jamie McAllister who ran out 2-1 winners. McMenamin spent the beginning of the next season on loan as a team mate of Neil Scally at Falkirk. McMenamin scored five goals at Falkirk before his last game there, a 2-0 defeat against QoS at Palmerston (Sean O’Connor, Garry Wood scoring), on December 27th. On returning to Livi, McMenamin broke through as a first team regular from March 21st. With some irony, this was the week after Livi won the League Cup Final 2-0 against Hibs with Jamie McAllister scoring in the final. McMenamin approached that season’s end full of goals scoring in five games in a row including against both halves of the old firm (the Rangers game was a 1-1 draw, Celtic won 3-1). McMenamin spent another season at Livi, one that was eventful for very different reasons from a League Cup win. Livi had gone into administration the month before the League Cup success. 2004/05 was a difficult season for them and a relegation battle boiled down to a last game of the season decider at home to Dundee. The 1-1 draw saw the Dees bite the bullet. It was in 2005/06 when the Wadsworth connection took effect. Wadsworth was on the coaching staff at Shrewsbury Town and recommended McMenamin to manager, Gary Peters. McMenamin spent one season with the Shropshire club scoring 10 times making him top scorer. Playing in English football’s fourth tier, the Shrews finished in 10th. In 2006 McMenamin was then a recruit (reunited with McGuffie) for what at the time seemed something of a juggernaut, Gretna. From a goal scoring angle this is the most prolific period to date of McMenamin’s career, 23 goals from his 46 league matches. In the season’s first three games against Ian McCall managed Queens, McMenamin scored five goals cumulatively as he and his then highly paid team mates scored 12 without reply. With derby game passions running high, McMenamin and Queens fans, well relations weren’t exactly great between the two. However, throw in a league title to add to his goals and much seemed rosy for McMenamin but of course that doesn’t tell all of the story. The management situation was unstable with Davie Irons taking over from Rowan Alexander with mixed messages emerging on the reasons why. Seemingly unstoppable when at one point clear by 12 points, their form was now much less convincing with second place St Johnstone haring down on them. Queens in comparison were a rejuvenated side following the January signing of Stephen Dobbie – Ian McCall’s best move as Queens Manager. In contrast to the previous three Dumfriesshire derbys, it was Queens who won with a convincing score line courtesy of a Dobbie double and one by Eric Paton with no Gretna goals in reply – the only game for Gretna in which Colin McMenamin didn’t score when playing QoS. The administration curse haunted McMenamin a second time and early in his second season, McMenamin was loaned out as the great Gretna clear out got going. McMenamin returned to his former club, Livingston. In his loan spell at Livi he played (and scored) in the Scottish Cup. This was consequential when he was signed by Dundee in the January transfer window. His Dundee debut was on 26 January 2008 in which he resurrected his habit of goals against Queens – he hit a double in a 3-2 defeat at Dens (Sean O’Connor scored two and Paul Burns one). When the two sides were drawn in the Scottish Cup quarter final, no one at Palmerston will have been disappointed McMenamin was cup tied from his earlier appearances for Livi. Ryan McCann wrote his place in Queens history with his quarter final goal from 84 yards as The Doonhamers won 2-0. "They have been playing with people`s lives, it`s shocking. The people who are at fault are not actually here. I had a good relationship with the chairman but I found out this morning that he resigned last night. I would have liked him to have been here. Even if it`s just to say he`s sorry about what happened, but he`s hiding." He added: "People are entitled to do what they want with their money but they`ve played stupid games with people`s lives. They signed players as recently as five weeks ago and now they have been laid off. You can`t tell me they didn`t know this was coming five weeks ago. If people want to come into football they should be made to show there is a plan behind it instead of a fairytale. Before anything is invested they should be made to prove the money is there. A lot of people have not been told the truth here. I`ve been through this before and this one has been the worst." Listed initially as a trialist, McMenamin`s QoS debut was on 23 October 2011, in a 5-1 heavy home defeat against Falkirk with Paul Burns the solitary Queens scorer. Then came the announcement on November 10th. There will rarely be a more apt choice of three words related to Queen of the South than the three chosen by Bill Goldie on the headline of the news posting - “Welcome Home Colin”. 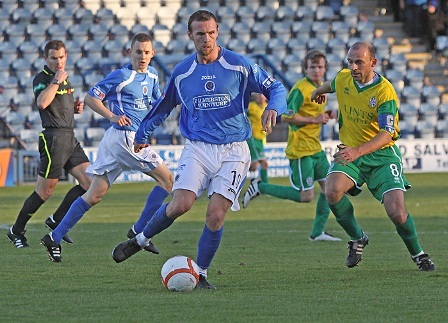 A deal had been sorted out for McMenamin to at last, aged 29, sign pro terms for Queens. McGuffie was already on the books to have the two in the same squad at a fourth different club. 1) Given a flicked Allan Johnston pass through the defence to run on to from outside the box, McMenamin was sharp to take a couple of touches to the right of the on rushing goallie before slotting in with his right foot. Ross County 1, QoS 1 final score. 2) Dispossessing a Falkirk defender and the taking the ball to just inside the corner of the penalty box, McMenamin scored with a beautiful right foot chip that if for example had been scored by Messi or Ronaldo, would have been flashed around the sports bulletins of the globe as a mark of genius. Such was his assurance he had wheeled away with his arm raised in celebration before the ball had even dropped below the bar and crossed the line. Queens won 3 – 0. 3) A defensive header drops to his feet near the penalty spot. One touch to control, one touch to fire in a right foot shot through a defender’s legs and into the bottom corner. QoS 2, Stirling 2 at the final whistle. 4) Poking the ball over the line from inside the six yard box in a mini scramble against Dunfermline. Final score, QoS 1, Dunfermline 3. 5) Getting away from his marker enough to be first to a corner to knock the ball home with his left peg from inside the six yard box. A 2-2 draw at Cowdenbeath. 6) Queens broke through the Dundee defence down the right hand side. Speed king David Weatherson is in acres of space and squares the ball into the middle with perfect precision. McMenamin has done his job and anticipated where the pass will be and knocks the ball into the bottom corner from six yards. The celebration is somewhat muted against his ex club. Final score, Dundee 2, QoS 1. 7) David Hutton hoofs a long kick out of goals. Derek Holmes flicks on and from the edge of the box McMenamin volleys a real belter over to just inside the far post. QoS 2, Morton 0 at the end. 8) Another route one goal. Hutton hoofs, Weatherson flicks on and McMenamin has the pace and precision to make it count with a first touch left foot shot across the keeper, low inside the far post. QoS 3, Stirling 1 at this point but he’s not finished for the day yet. 9) Queens work a free kick down the right hand side. Three short passes later the ball is given to Willie McLaren on the edge of the box. McLaren’s first touch cross from the right is slightly behind the ideal position for McMenamin to get on the end of. McMenamin arches his back while he jumps and send a quality header to just inside the keeper’s right hand post. Final score QoS 4, Stirling 1 and nine goals for McMenamin at this point from his last 15 games. Just looking at things from a goal scoring perspective would be myopic though with McMenamin’s contribution being much more than just when he puts the ball in the net. One of the words used describing him in the Queens match reports is an excellent description of what McMenamin is about – industrious. A 100 percenter not afraid to close down defenders nor to help build up play for team mates, not all of his Queens performances were as a forward. With Kenny Brannigan facing player availability issues, in three games McMenamin seemed a decent choice to drop back to help out in midfield. With the kind of game he has, maybe in the years to come as the legs slow up a little a career extension via reinvention as a midfielder could be an option. To run the analysis from a different angle, what of McMenamin when things go wrong? Each to their own for the biggest disappointments of season 2010/11. Two cup games seem viable candidates. McMenamin played in the Scottish Cup contest at home to Brechin. It’s perfectly reasonable for any team to fancy their chances when drawn against lower division opposition in a cup tie. Aberdeen will have fancied their chances in recent seasons when drawn with Queens. Similarly, its hardly being disrespectful for Queens fans to view being drawn against Brechin last season as an excellent opportunity to progress. Life isn`t that straight forward. McMenamin worked the ball on the left hand side into a shooting position before hitting an excellent low, curling, right foot shot inside the far post. McMenamin’s effort during the game suggested that at least he was man enough to feel some shame at the sub-abysmal performance the Queens side delivered that evening. Brechin went through 2-1. The rescheduled Challenge Cup Final was played on a beautiful day in April in contrast to the hypothermic Arctic wind when Queens played in the final in 2002/03. For Queens, the weather was about the only thing that went right. David Hutton is a capable reflex goalkeeper for Scottish First Division standards. What went through his mind when given that routine pass back by David Lilley, Hutton no doubt will have since asked himself that question more than anyone. Its happened though and credit to Andrew Barrowman for the pressure he applied to earn the chance to roll the ball into the empty net from all of one yard. A shocking start for Queens but still not justification for the performance that was to follow in the remaining 82 minutes. Beyond abject, the Queens performance must have left the County players bemused over how pleasant a stroll they were allowed in the afternoon sun. Cup tied McMenamin watched the game from the stand having played in the competition earlier in the season for Dundee. Would McMenamin have succumbed so weakly without a fight? It would take some believing to think yes. So to a previous question from above, what did Queens do for McMenamin? For a start he was given a platform to show case his abilities following the uncomfortable and abrupt end he had to his term as a Dundee player. Of course he took his chance at Queens with both feet (and his head). His 9 goals in the 26 league games for Queens was up til then his best league strike rate (35%) outside his 23 from 46 games for Gretna. Otherwise his pre QoS league strike rate through his career was around the one in four mark. As mentioned it would be a misjudgement to look at McMenamin’s game only from a goal scoring perspective. As Derek Holmes will tell anyone, its goals scored though plenty people look at first when assessing forwards before the other aspects of their game is looked at, regardless of the other value adds. Thus McMenamin’s productive time in front of goal in Queens colours did his shop window value no harm at all. It was confirmed on 19 May 2011 on the Queens website that despite an offer from Queens and two other clubs, McMenamin had signed for divisional big spenders, Ross County. For the time being at least, McMenamin’s Queens days were over. Queens finished the season fourth in the second tier of Scottish football for the fourth time since the 2002 promotion. None have been bettered since 1958. The tale doesn’t end there quite just yet. 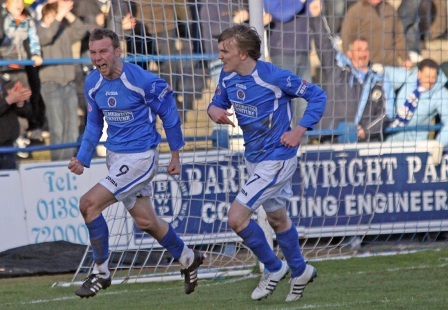 McMenamin returned to Palmerston in County colours in January this year. When taken off near the end of the game, McMenamin was acknowledged with applause from some among the Queens support. The antagonism of his pre Queens days was long gone with Queens fans remembering the hard working and committed player who had impressed refulgently in QoS colours the previous season. It goes both ways though with McMenamin on his twitter page displaying the Queens beach towel he has bought from the Queens Trust supporters group. Other comments on there have McMenamin urging fans support and the current Queens squad for success in the relegation battle in which they are mired. As a post script to the original publication of this feature. 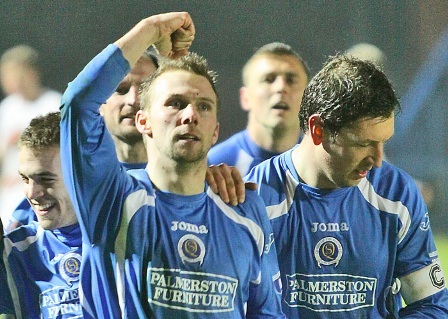 Colin McMenamin returned to Palmerston on 5th May 2012, the last day of the season`s Scottish League campaign. The fortunes of McMenamin and his expensively assembled team mates could have contrasted little more to those of the mega-austerity packaged Doonhamers. County had won promotion as champions weeks before and romped home 24 points ahead of second placed Dundee with County losing only one league game all season. McMenamin ended the season as the division`s top scorer with 19 goals from the 34 league games he played. The last of those 19 McMenamin goals was in that season ending 5 - 3 win at Palmerston. Already relegated the week before, This was the first Queens game with Allan Johnston as manager.